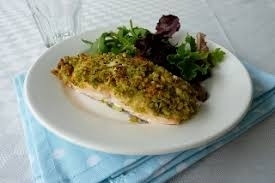 To marinate take the fish fillets and mix well with basil pesto, salt and lime juice and keep in refrigerator for 30 minutes. After 30 minutes bring it out. Grease a pan and cook fish at low flame for 15 minutes. Serve with side dish like grilled pineapple/ sauteed bellpeppers. 1 tsp extra virgin olive oil. method- Toast the nuts for extra flavor in a medium skillet. Add all ingredients in mixer jar and mix well. Add salt as per the requirement and lime juice. DR. DEEPIKA’S WELLNESS A Unit of Dr. Deepikas Healthplus Pvt. Ltd.